Discussion in 'Android Devices' started by anm00727, Aug 10, 2010. Hi, are there any email widgets which would let me see all my accounts on one screen, instead of having the stock htc one only showing one of them, then switch between the two in the app. I use K-9 Mail and opening it shows all your accounts on 1 page. 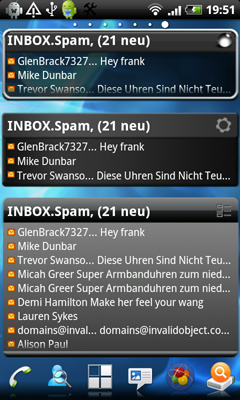 The account name, email address for the account, and the number of unread messages in each inbox is also shown. Plus, there's a sync-all button for polling all accounts with a single tap. i use K9 too. the only drawback is that is doesn't fully support Exchange accounts. another alternative could be an maildroid. it also doesn't support exchange (yet) but it does get good reviews. I was using K9Mail for this very reason but went back to the HTC mail program when I found out K9 can't forward html formatted email. I route all my email to my gmail account and use the gmail app. 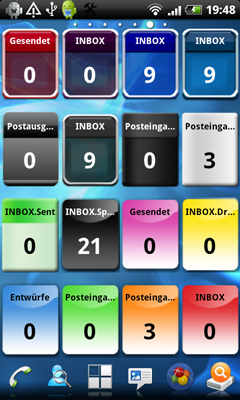 as for a widget I have it combined along with various other things in to pure messenger widget.